When planning a trip to out of Buenos Aires, there are a few options that make perfect day-long excursions. 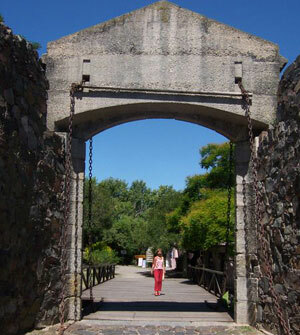 Perhaps the outing that has the most contrast to the hustle and bustle of crowded downtown Buenos Aires is the little coastal town of Colonia, Uruguay. Reached easiest by a ferry boat, Colonia offers a relaxing get-away and a small taste of what other South American countries have to offer. Multiple ferries leave the Buquebus terminal in Puerto Madero each morning, and the rides range from 45 minutes on a “fast-ferry” to around three hours on a more scenic (aka slower) boat. 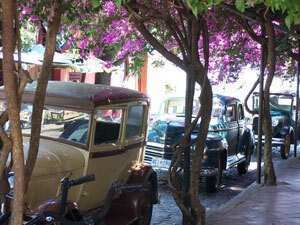 Once you arrive in the Colonia port, it is just a quick five minute walk to the historic tourist section. Riddled with cobblestone streets, old one and two-story buildings, and historic landmarks, Colonia is most definitely a beautiful, old-fashioned town filled with extraordinary charm. Although the streets can be walked from one end to the other in less than a half hour, Colonia serves as a nice daylong trip because of the intricate character of each little shop, museum, and restaurant. 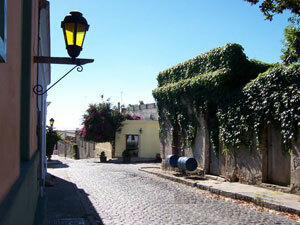 Multiple small one and two room museums offer quick insights into Colonia’s rich history. From textiles to art, these museums showcase the pride and joy of the Uruguayan people. A tall lighthouse stands at the corner of the old historic city next to the ruins of a trampled convent, and can be climbed, yielding a beautiful 360 degree view of the city, ocean, and on a clear day, across to Buenos Aires. Along every street, little local gift shops offer unique pieces of Uruguayan paraphernalia. Hand-made pottery, wood-carvings, as well as original jewelry and clothing are just some of the offerings that these shops sell at prices just as inexpensive as tourists are used to in Buenos Aires. Around 1 or 2pm, the familiar smells of asados, parillas, and other artisan restaurants begin to overwhelm the senses. With menu offerings similar to Argentine cuisine, but with more of an assortment of seafood than most Buenos Aires restaurants, good food is not hard to find. And of course, when lunch is over and the sun is beating down, it is hard to go anywhere in South America without your choice of multiple ice cream parlors. Before you head back to port to catch your return ferry (most boats to Buenos Aires leave between 7pm and 10pm), you can choose to relax in one of the many parks or along the small sandy beaches which border most of Colonia. In short, Colonia is a beautiful daylong excursion that is definitely recommended if you are looking to get away from the busy city-life of Buenos Aires. While you can see most of what the city has to offer over the course of just one afternoon, it provides a great contrast to Buenos Aires and really offers tourists another look at what more quaint South American cities are like. And as expected, on the cruise back you are treated with a fairy-tale ending in the form of a beautiful sun setting over the Buenos Aires skyline. This page rendered in 0.867 seconds.